Everywhere you turn in Las Vegas you will be welcomed by perfect instagram spots! The busy city is perfect for instagram photos; whether you want busy scenery photos; simple photos which focus on you or even the best foodie pictures . . . Vegas has it all! If you are looking for a perfect instagram destination, then Las Vegas is the place for you. With no plan in place for what instagram photos we wanted to get, everything we have shared has been a spur of the moment photo. This has allowed us to capture the emotions of the moment and take photos that we truly love. Although you are probably thinking that with so much to see and do, instagram photos will be easy to find and take . . . well let us show you where to find the best ones . . .
Every hotel in Vegas is amazing! You will be amazed by the size of everything, and the astonishing architecture of the hotels. Every hotel is unique and different. One minute you are in a hotel which has architecture like New York sites and the next you could be inside a medieval inspired castle. With lots of amazing sights the hardest choice you will have, will be deciding where to take your photos . . . The New York, New York hotel is one of the most elaborate hotels within Vegas. It stands out to passers by, and is hard to miss due to the magnitude of New York inspired architecture and statues on the walkway. From the Brooklyn bridge to Statue of liberty; if you are looking for iconic instagram photos then this is the location for you. Whether you have been to NY and want to take similar photos in Vegas or have never been to NY and want to get your first photos. This may have been one of our favourite hotels for instagram shots! Yet again another iconic city, the Paris hotel is home to some replicas of well-known Parisian structures. The hotel building itself is a classic, yet elegant structure. But in-front of this you will find the Eiffel tower, which due to its large size can be seen from far away. This makes it perfect to get far away photos from across the road at Bellagio. The Paris hotel also has the iconic Arc de Triomphe structure replica which is perfect to pose in front of and a Paris sign in the shape of the Montgolfier balloon. With lots of stunning architecture the Paris hotel is perfect for any shot, day or night! The flamingo hotel is another great spot for quirky instagram photos. With neon pink signs, a giant pink flamingo and real flamingos in the gardens! Whether you love flamingos or not, the hotel has some pretty amazing instagram opportunities! You will find the real flamingos inside the gardens in the hotel; here you can get instagram photos of just the flamingos, or if it isn't too busy you can get shots of you as well. The giant flamingo structure is located at the door on the back, where the food street is. The flaming is hard to miss! One of our favourite instagram photos . . . 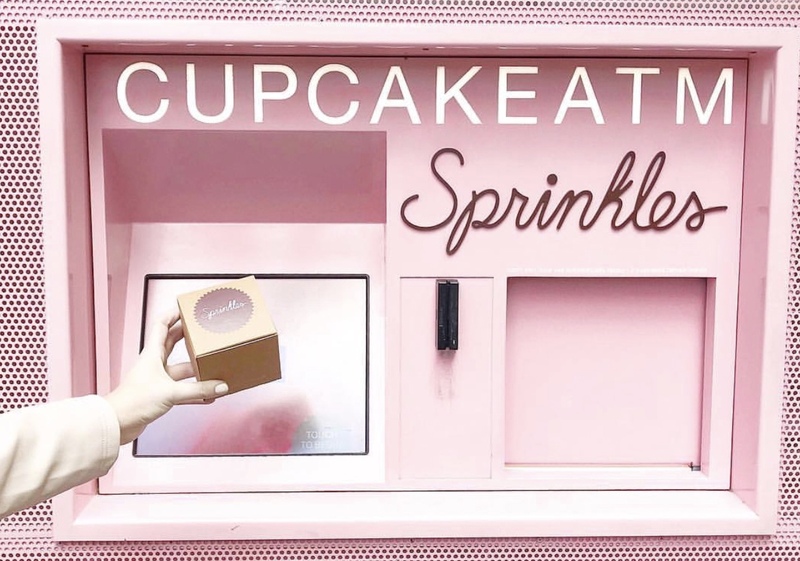 The sprinkles cupcake ATM is not only a Vegas photo opportunity, with stores in lots of big cities across America. However it is always a photo opportunity when we come across an ATM. The ATM, being pretty and pink is perfect to brighten up your instagram and get a delicious cake! Outside the city . . . This is probably one of the best instagram photos! The most iconic Vegas photo you could wish for. Just make sure you go early to miss the queues! We would love to hear your favourite instagram spots in Las Vegas? Did you prefer hotels in the city or scenery outside the city?